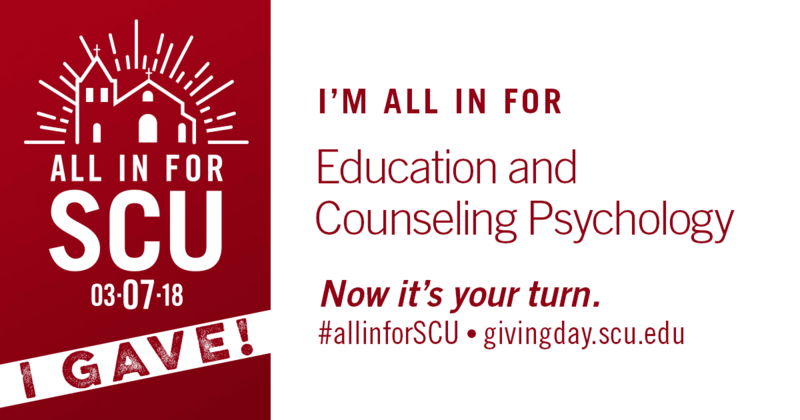 Education & Counseling Psychology has raised $ 5,475 from 27 gifts! ARE YOU ALL IN FOR EDUCATION AND COUNSELING PSYCHOLOGY? YOU can help build momentum for the causes you care most about by saving the image below and sharing it on your social media sites to show your Bronco pride! Last year, the School of Education and Counseling Psychology awarded scholarships to hundreds of students in the teacher education, educational leadership, and counseling psychology programs. We are especially committed to providing scholarships to ensure that our DACA students can complete their programs and that those whose mission is to serve in communities of profound need can graduate with very little debt. Your donation will support our efforts to provide the financial resources needed for those doing some of the most challenging and important work in our communities, and assure that those with the greatest need will be served by those with the finest preparation around – A Santa Clara education. On March 7, 2018, join me in going all in for Santa Clara!